This year's Carrom World Championship was held in Sri Lanka. 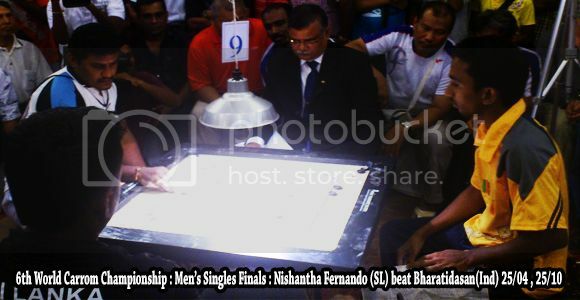 The Men's Singles Final was played between Nishantha Fernando of Sri Lanka and Bharathidasan of India. It was won by Nishantha Fernando by 25 points to 04 and 25 points to 10. This is the final match. It is uploaded into 6 parts. Our heartiest congratulations to the winner Nishantha Fernando.